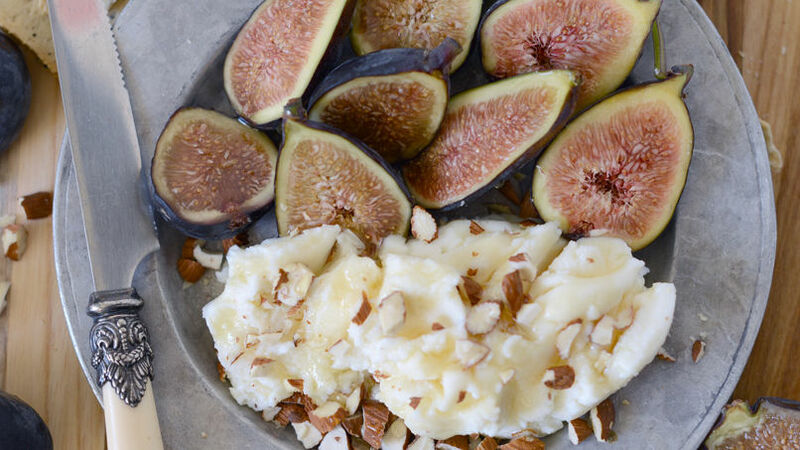 On a serving tray, arrange sliced figs and ricotta. Drizzle with honey, sprinkle with almonds and garnish with a sprig of mint. Add prosciutto or dry-cured Spanish jamón serrano for a non-vegetarian option. Ericka Sanchez Figs are in season and this sweet fruit makes the most elegant appetizer. Because they pair well with fine wines, cheeses, nuts and meats, they are a must at your next fancy gathering. Preparing a fig tray is simple and effortless. All it takes are a few ingredients from your local grocery store or specialty food store. No cooking is involved and the entire appetizer will be ready in less than 10 minutes.